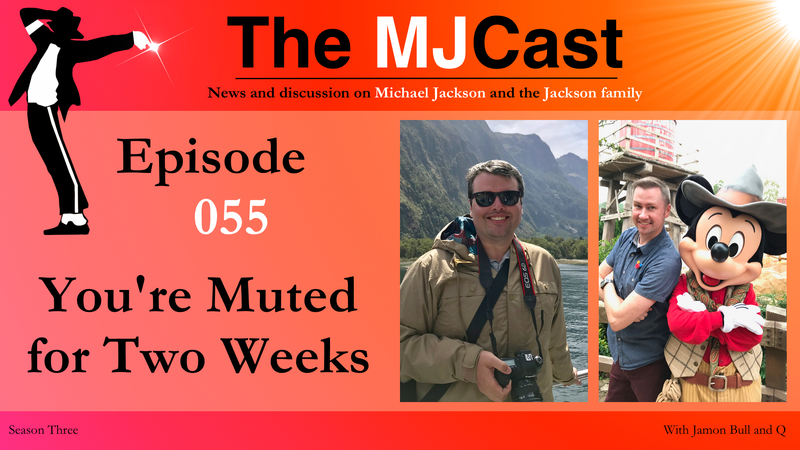 Having grown sick of having to keep interviewing Michael Jackson’s friends and collaborators, Jamon and Q appear on their own this week with a good, old-fashioned news round-up. The show kicks off with the news that Janet Jackson might be touring again soon, followed by the depressing news that Michael’s former manager Sandy Gallin recently passed away, then the even more depressing news that somebody has decided to perform a cover version Man In The Mirror. The despair continues with the announcements that convicted killer Conrad Murray has recorded an interview with celebrity quack Dr Oz, Taryll Jackson is to undergo televised counselling on a dubious reality TV show and Britain’s Channel 5 – which previously brought us such marvels as ‘Michael Jackson’s Face’ and ‘When Pilots Eject’ – has produced a new Michael Jackson ‘biopic’. Oh, and a Michael Jackson impersonator has started charging fans to go on holiday with him. But there are some glimmers of hope. World-renowned biographer J Randy Taraborrelli has broken his vow of silence on Michael Jackson and agreed to update his biography for 2019. Jackie Jackson has given an in-depth interview to the UK’s Times newspaper ahead of the Jacksons’ impending 50th anniversary tour. And Brad Sundberg has announced he will host one of his amazing In The Studio With MJ seminars in Los Angeles in June. After the news, Jamon and Q argue the pros (tracks 1-5) and the cons (the rest) of the Blood on the Dance Floor album, which, frighteningly, turns 20 this year. This entry was posted in The MJCast, Uncategorised and tagged Blood on the Dance Floor, Blood on the Dance Floor (8mm Version), Blood on the Dance Floor (Refugee Camp Mix), Brad Sundberg, Breana Cabral, Brett Rather, Bruno Mars, Camila Cabello, Conrad Murray, Dr Oz, Esonic, Ghost Of Another Lover, Ghosts, HBO Special, History, History (Tony Moran's History Lesson), Ignition (Remix), In the Studio with Michael Jackson, Is It Scary, Iyana: Fix My Life, J Randy Taraborelli, Jackie Jackson, Janet Jackson, Jankins, Jimmy Fallon, Katherine Jackson, Making Michael, Man In The Mirror, Michael Jackson, Michael Jackson: Man In The Mirror, Michael Jackson's Private Home Movies, Mike Smallcombe, Moonwalk Talks, Navi, One Night Only, podcast, R Kelly, Race Through New York, Rob Hoffman, Sandy Gallin, Stranger in Moscow, Super Bowl, Taryll Jackson, The Jacksons, Travelling With a King, Trent Jackson, Universal Studios by Charles Thomson. Bookmark the permalink. Guys read so many there are so many read his book too but didn’t he change his mind about things later too??? I watched the MJ documentary Man in the Mirror starring Earnest Valentino. I agree with you guys, that many positive things were left out of the documentary. From what I understand, when agreeing to participate in this documentary Earnest Valentino wanted to make sure this movie would not belittle Michael or make him look bad. Many positive scenes were recorded but they were left out in the final product which was disappointing and made the whole thing feel negative. Which is sad. However the goal of the biopic was to inform the public about the flip side of Michael’s enormous success, and in that I think they succeeded. To me its a good thing that they showed scenes from the Pepsi accident since people dont seem to realize how badly Michael was injured. Same thing when they included the scenes where Michael was photographed during the investigation in 1993. I believe the general public has no idea he went through all that. Some fans may not like to see these things, as I can understand its painful to be reminded of, but I personally didnt mind it since it’s the facts. Though not a professional actor, I think Earnest portrayed Michael really well and conveyed to the public his struggles and pain. In my opinion he did a good job and was very convincing as Michael Jackson. Just my 2 cents ?